With its breathtaking beaches, mouth-watering cuisine, and rich history, Turkey has everything you need for an adventure vacation. You can start your trip by marveling at the mosques and palaces in Istanbul, but it won't be long before you want to head straight to the white sandy beaches and sparkling blue waters of the Mediterranean Sea. Don't forget to leave time for the country's inland as well; the crumbling castles and cloud forests might just be the highlight of your trip. 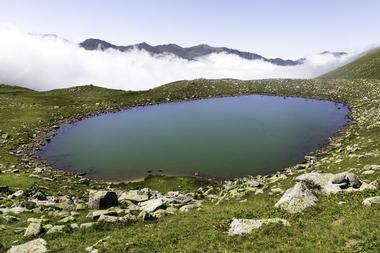 Despite its gloomy name, the Black Sea is just as worthy of your time as the Mediterranean and Aegean Seas. The region receives an astonishing amount of rainfall every year, so although the skies aren't always blue and sunny, the land is green and lush. The climate is excellent for farming; visitors can check out terraced tea plantations, huge hazelnut farms, and some of the world's oldest cherry orchards. Most visitors choose to begin their time here in the city of Trabzon, but there are also plenty of tiny fishing villages for those who want to get a taste of traditional Turkish culture. Sitting in the middle of Lake Van, Akdamar is best known for being home to the famous 10th-century Akdamar Cathedral. The church has been converted into a monument museum, and it boasts a number of excellent bas-relief carvings on the exterior walls, including an image of David and Goliath. After exploring the church, visitors can swim, picnic, stroll through the almond groves, or try to spot the white winged tern and other birds. Akdamar is roughly four miles away from the shores of the district of Gevas, and it takes approximately twenty minutes by boat to reach the island. Situated on a small peninsula that juts out into the sparkling blue waters of the Mediterranean Sea, Alanya is a seaside resort town that offers an appealing blend of adventure and relaxation. Anyone looking to relax and unwind can lounge on the beach or visit a traditional Turkish bath house, while more adventurous visitors can go SCUBA diving, paragliding, donkey riding, or take a Jeep safari tour. The most impressive sight in the city is the iconic 13th-century citadel; perched on the top of a rocky hill, the site offers excellent panoramic views of the city and the ocean. Often thought of as the gateway to Turkey's southern Mediterranean Riviera, Antalya is a fast-growing resort city with an impressive array of beautiful beaches and luxurious hotels. At the core of the city is the historic old quarter, which is closed off from the rest of the city by ancient stone walls and is home to a 125-foot minaret, a beautiful harbor, and several interesting ruins. Beautiful beaches lie to either side of the city; the western Konyaalti Beach boasts attractions like a large water park and an aquarium, while the eastern Lara Beach is home to a large number of luxurious hotels. 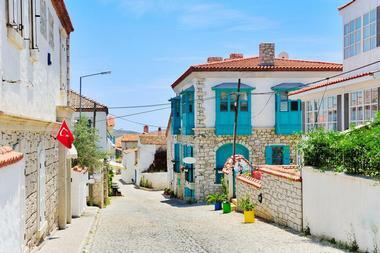 Almost entirely surrounded with beaches, Avsa Island is set in the southern Sea of Marmara. The sun and the sand draw most visitors here, but the island is also known for its many vineyards, its locally produced wine, and the wonderful seafood served in its restaurants. There are also plenty of excellent bars and nightclubs for visitors to enjoy, particularly along the seaside Sahil Avenue. The island is easy to reach by boat from Erdek, Tekirdag, and Istanbul, and once on the island, visitors can easily make a day trip to the nearby Marmara Island. One of the country's most popular holiday resorts, Bodrum lies on the site of the ancient city of Halikarnassus and is the former location of the Mausoleum of Halikarnassu, one of the Seven Wonders of the Ancient World. Although the mausoleum was destroyed during the Middle Ages, the city's twin bays offer stunning views of the iconic Bodrum Castle, which dates back to the early 1400s and is now an excellent museum. A number of other fascinating historic ruins can be found throughout the city, but modern advances mean that there are also plenty of restaurants, bars, and shops for visitors to enjoy. Bosphorus is a natural strait that connects the Black Sea to the Sea of Marmara, and it separates Asian Turkey from European Turkey. Three suspension toll bridges stretch over the water, but the best way to enjoy the strait is to take one of the many available leisurely boat cruises. These range in length from two hours to the entire day, and special evening tours are offered during the peak summer months. Plenty of excellent seafood restaurants and teahouses line the shores of the strait, and many cruises include stops that allow visitors to enjoy a meal or a drink. 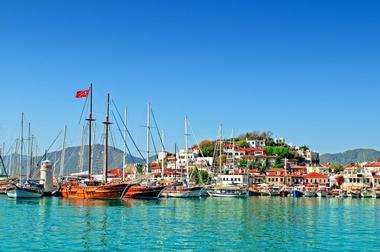 Also known as Tenedos, Bozcaada is the third largest island in Turkey and perhaps the most beautiful. Much of the island's coastline is made up of rocky cliffs, but there are plenty of secluded sandy coves for anyone interested in going for a swim or relaxing on the beach. Other highlights of the island include its picturesque windmills, its vineyards and wineries, its seafood restaurants, and its many historic monuments. 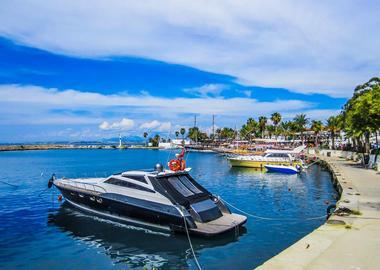 Visitors who would like to bring their cars must take the ferry from the Geyikli Yukyeri Port, but a passenger-only ferry service is available directly from Canakkale. Nestled in the foothills of Mount Uludag, Bursa is one of the country's most important industrial centers. However, the city is also a great place for a visit. As the original capital of the Ottoman Empire, Bursa boasts a dizzying array of beautiful mosques and külliyes, impressive examples of early Ottoman architecture, fascinating museums, and traditional thermal spas. It's possible to see the city's main sights on a day trip from Istanbul, but there are plenty of wonderful accommodation options for anyone who would like to spend more time enjoying all the city has to offer. Canakkale is the perfect base for anyone who would like to explore the Gallipoli battlefields and the ruins of Troy, but there are plenty of great things to see and do in the city as well. One of the most impressive sights is the Çimenlik Fortress, which dates back to the 15th century and now houses both a Military Museum and a Naval Museum. The city center is small enough to explore on foot, and visitors interested in the history of the area should also visit the Trojan horse on the waterfront and make a trip to the nearby Archaeological Museum. Cappadocia is likely to be one of the most unique places you'll ever set foot; with its strangely shaped rock formations, the region looks like something out of a fairy tale. A number of excellent hiking trails wind their way through the rocks, but it's also worth taking the time to descend underground and explore the honeycomb-like cities dug out into the rock. The area is also known as one of the best places in the world to fly hot air balloons, and the sight of hundreds of hot air balloons flying over the surreal landscape at sunrise is a once-in-a-lifetime opportunity. Nestled in the gently rolling Thracian plains, Edirne is located right next to the Greek and Bulgarian borders. The city was the second capital of the Ottoman Empire, and it boasts a large number of beautiful mosques; at the heart of the city is the 16th-century Selimiye Mosque, which features a large dome and four minarets and was built by the renowned architect Mimar Sinan. Other highlights of the city include the beautiful Great Synagogue, the graceful stone bridges that arc over the Meriç River, and the picturesque wooden houses scattered throughout the city's old Roman district. Perched at 2,000 meters above sea level, Erzurum is the highest major city in Turkey and is the best place to base yourself if you'd like to explore the eastern part of the country. A visit to the city isn't complete without a stop at the Citadel of Erzurum. Located on top of a hill in the city center, the citadel has a clock tower that can be climbed for great views of the city and the surrounding mountains. Another draw of the city is the nearby Palandöken Mountain, which turns into a bustling ski resort in the winter. Despite having been destroyed by an earthquake in 1958, the seaside city of Fethiye has grown into an exciting tourist destination with a busy nightlife scene. The most unique feature of the city is the stone sarcophagi scattered throughout the streets, but the massive Lycian rock tombs tucked behind the town center are well worth a visit as well. The city is also home to one of the best natural harbors in Turkey, and boats and yachts of all sizes are available for charter if you'd like to spend some time out on the waters of the Aegean Sea. The Gallipoli Campaign was one of the bloodiest battles fought on Turkish soil during World War I, and today the Gallipoli battlefields stand as an important memorial to the soldiers who fought and lost their lives there. The site is now protected as a Turkish national park; the battlefields cover 335 square kilometers, and the Gallipoli Simulation Center offers 11 excellent exhibits on the history of the area. 40 Allied war cemeteries and over 20 Turkish cemeteries can be found here, and visitors are advised to spend at least a day or two exploring the area. Informally known as Antep, the city of Gaziantep is the commercial heart of Turkey's southeast. There's no shortage of hotels and restaurants, and unique souvenirs can be purchased from the artisans in the Coppersmiths' Bazaar. A number of excellent museums can be found here as well, including the Gaziantep Zeugma Mosaic Museum, the fascinating Gaziantep Zeugma Mosaic Museum, and an archaeological museum that houses an excellent collection of Roman ceramics. The area has always been famous for its pistachio orchards as well, and today the city is undoubtedly the best place in the world to sample traditional pistachio baklava. A visit to Turkey wouldn't be complete without spending some time in Istanbul. With its unique location straddling Europe and Asia, the city is a living melting pot of East and West. Most of the city's best-known sites are found in the Old City, but the entire city skyline is a jaw-dropping mixture of Byzantine churches and palaces adorned with beautiful mosaics and frescoes, regal Ottoman mosques, and modern skyscrapers. Aside from its impressive architecture and fascinating history, the city offers world-class museums and art galleries, a buzzing nightlife scene, and many of the best restaurants in the country. 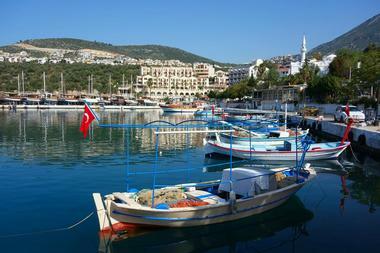 The third-largest city in Turkey, Izmir is situated near the sparkling azure waters of the Bay of Izmir. Approximately half of the city's residents are under the age of 30, giving the city a laid-back, youthful atmosphere that manages to welcome people of all ages. There are plenty of things for visitors to see and do here, but highlights include taking a horse-drawn carriage along the beautiful waterfront promenade, visiting the city's impressive museum of history and art, and stopping by one of the most interesting bazaars in the country to do a bit of shopping or people-watching. Soaring high above the coast of the Black Sea in eastern Turkey, the Kackar Mountains are truly a wondrous sight to see. The glaciated mountains boast steep rocky peaks and plenty of alpine lakes; visitors can enjoy a wide range of outdoor activities including hiking, camping, heliskiing, and mountaineering. The mountains are also a great place to visit if you're interested in whitewater rafting, as the Çoruh River that runs through the southeastern side of the range is known as the birthplace of the sport and is one of the best places in the world to give it a try. Formerly a peaceful fishing village, Kas is a charming little town tucked right up against the sparkling blue waters of the Mediterranean Sea. Visitors are drawn here by the calm, unhurried atmosphere; it's easy to wile away the time relaxing in a waterfront cafe, lounging on a boat headed to the Blue Cave, or taking a stroll up to the cliff tombs above the city. However, there are plenty of more adventurous activities to be found here as well. Kas is one of the best places in Turkey for SCUBA diving, and it's easy to arrange kayaking tours and trips to the nearby ruins. 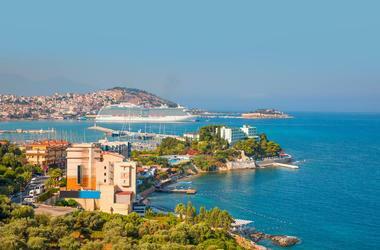 Kusadasi is the busiest cruise port in Turkey, and it offers plenty of tourist amenities as well as easy access to several beautiful beaches. Restaurants, cafes, and shops line the waterfront, and there is an excellent nightlife scene for visitors to enjoy, particularly in the summer. Anyone interested in doing some shopping will want to visit the open-air bazaar in the downtown area, which sells everything from souvenirs to traditionally made Turkish rugs. However, there is still plenty of historical architecture to marvel at, including the city walls, a mosque built in 1618, and a Byzantine castle known as Kadikalesi. Tucked up against a backdrop of pine-covered mountains on the Turkish Riviera, Marmaris is a popular resort town known for its rowdy atmosphere and lively nightlife. It's also a great place to kick off a cruise along the coast; plenty of charter boat companies can be found in the harbor. Bar Street is the place to be after dark, and visitors will find an astonishing selection of bars, open-air clubs, and music venues here. During the day, visitors can lounge on the pebbly beach, stroll along the beautiful seafront promenade, or visit the charming 14th-century Marmaris Castle. Pamukkale is a word that means "cotton castle" in English, and once you visit this incredible natural site, it's easy to see how it got its name. Hot mineral-rich streams of water cascade down the terraces of a towering mountain, leaving behind a gleaming white coat of calcite. 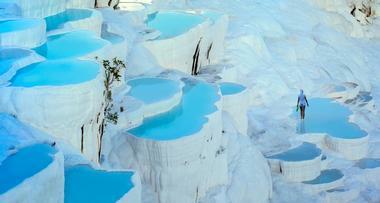 Most of the terraces are off-limits to tourists, but a series of artificial pools allows visitors to bathe in the steamy water. The site gets quite busy during the day, but visitors can choose to stay in the nearby village of Pamukkale and head to the site in the early evening. 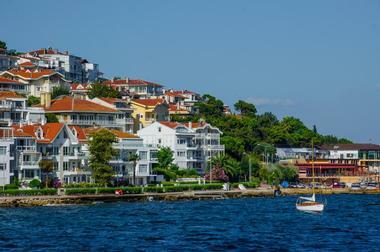 Located southeast of Istanbul in the Sea of Marmara, the Princes' Islands are a group of nine easily accessible islands. Buyukada, Heybeliada, Burgazada, Kinaliada, and Sedefada offer beaches and are the most popular of the islands; visitors must pay a small admission fee. Cars are not permitted on most of the island, but the streets are easily walkable and visitors can hire horse-drawn carriages or bicycles if they wish. The islands can be reached by ferry from Eminonu, Kabatas, Kadikoy, or Bostanci, and it's entirely possible to visit two or more of the islands in a single day. One of the country's best-known sites for classical architecture, the ancient city of Side is now a bustling tourist town on the southern Mediterranean coast. The principle architectural highlight of the city is a 2nd-century theater that could seat up to 15,000 people, but impressive Roman and Hellenistic ruins can be seen scattered all throughout the city. However, the town is known for more than just its history; visitors flock here to enjoy the beautiful white sandy beaches, the relaxing waters of the Mediterranean, and the seemingly endless selection of accommodation, restaurants, bars, and trendy shops.